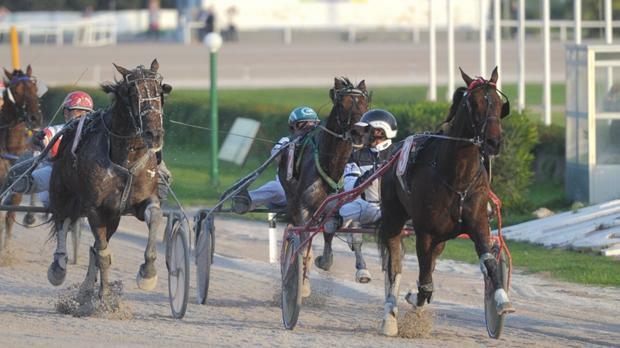 Yesterday’s meeting at the Marsa Racetrack marked the start of the Republic Day Championships for all classes on a long distance of 2,640 metres. The programme consisted of 10 races, all heats from these different championships, the most important being that for Premier Class trotters. Veikko Hornline, under the guidance of Julian Farrugia, prevailed in the Premier heat for its fourth win of the year. Six of the 13 starting trotters progressed to the final stage. Veikko Hornline (Farrugia) made the fastest start, opening a slight lead from Carmen Sund (Kurt Saliba) and Zwack (Eric Bezzina). Farrugia kept Veikko Hornline in the lead to win easily by a length-and-a-half from Wiss Roadrunner (Mario Farrugia) and P.A. Surprise (Lorraine Cunningham). Italian mare Madam Di Poggio (Charles Camilleri) was fourth. Zwack and Carmen Sund also qualified for the final. The winner clocked an average time of 1.17.7” per kilometre. The other heats were reserved for Gold, Silver, Bronze and Copper Class trotters. In the first of the two heats for Gold Class horses, Danish Obelix Molgard (Salvu Vella) dashed strongly from the outside midway through the final straight to secure its third win of the year from Wies Buitenzorg (Eric Bezzina) and Robin Du Suret (Cliferty Calleja). Pro Shop (Felix Casha) was fourth. There was a keen tussle between three horses in the final metres of the second Gold Class heat. It was Beckham Bob (Jesmar Gafa) which had to go all out in order to gain its second win of the year from Oolong (Noel Baldacchino) and Pissaro (Anton Cassar). Cowboy Party (Chris Cassar) followed home in that order. The next horse racing meeting at Marsa is scheduled for Friday evening with the first race starting at 6.30pm. Race 1: Republic Day Heat (Copper), Dreamed Victory (Rodney Gatt) – 1.20.5”. Race 2: Republic Day Heat (Silver), Roc Magister (Kirsten Axisa) – 1.18.8”. Race 3: Republic Day Heat (Copper), Uranus Du Cours (Jason Cordina) – 1.19.7”. Race 4: Republic Day Heat (Bronze), Ramelon (Tony Cauchi) – 1.18.6”. Race 5: Republic Day Heat (Silver), Paolin De Bannes (Michael Ellul) – 1.18.1”. Race 6: Republic Day Heat (Gold), Obelix Molgard (Salvu Vella) – 1.18.7”. Race 7: Republic Day Heat (Bronze), Famous Faberge (Noel Baldacchino) – 1.19.5”. Race 8: Republic Day Heat (Premier), Veikko Hornline (Julian Farrugia) – 1.17.7”. Race 9: Republic Day Heat (Silver), Sigurd Palema (George Grech) – 1.17.9”. Race 10: Republic Day Heat (Gold), Beckham Bob (Jesmar Gafa) – 1.19.1”.